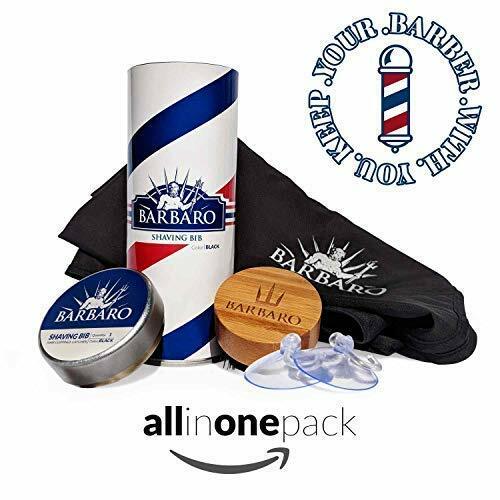 BARBARO shaving bib set is unique bundle that comes in a cylinder tin can including transparent suction cups (2 pieces) and one quality maple brush that is made of boar bristles. 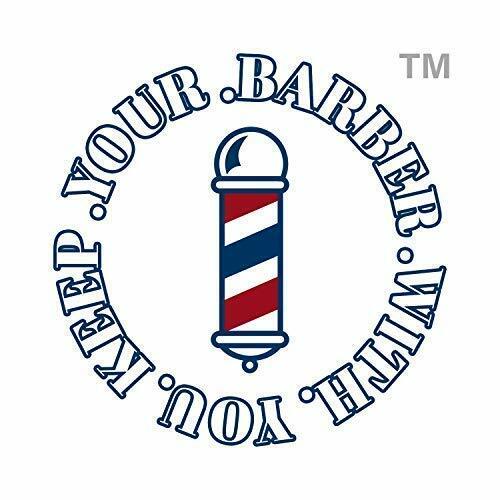 Check the ultimate guide for DIY barber. COMPACT: Packaged in sleek can to easy storage or travel. Rule the Beard, Reign the Look. EASY TO USE: Attach the neck straps and secure to the mirror. 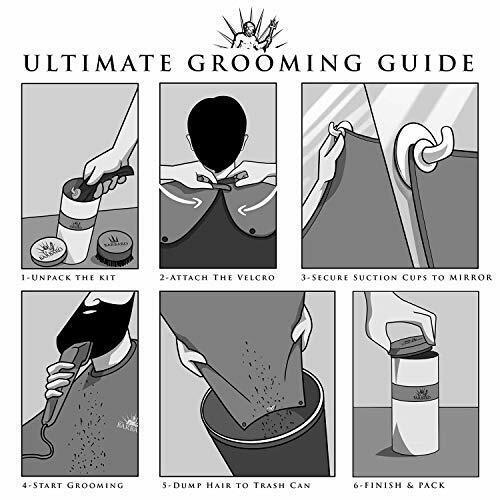 Start your normal manscaping and grooming. Once complete lower over the trash can and gently shake. SMART DESIGN: Our smart premium design pack allows hands free set up for easy trimming. BARBARO capes have total of 4 rustproof stainless steel rings on each corner allows waterproof function. Simply secure suction cups on the wall and hang the rings on each side. ADJUSTABLE: Inbuilt hook and loop application around the neck helps adjusting for anyone. FAST & EFFICIENT / NO MORE CLOGGED DRAINS – No more facial hair scattered all over your bathroom vanity. 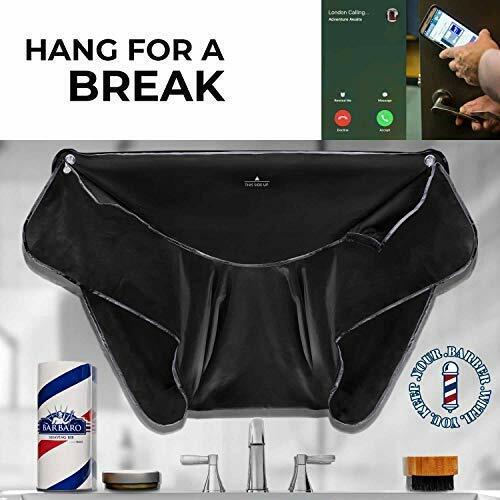 Catches your beard, mustache, sideburns, and hair trimmings. It is easy to dispose once trimming is over. No more mess or blocked drains. Save yourself some time. 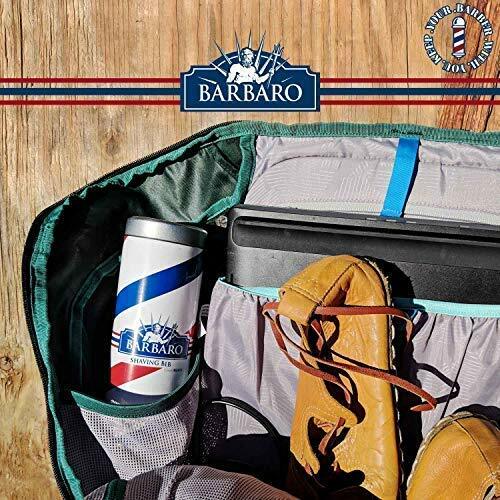 CARRY ON – BARBARO Shaving Bib kit takes up little space in your bag for easy traveling. 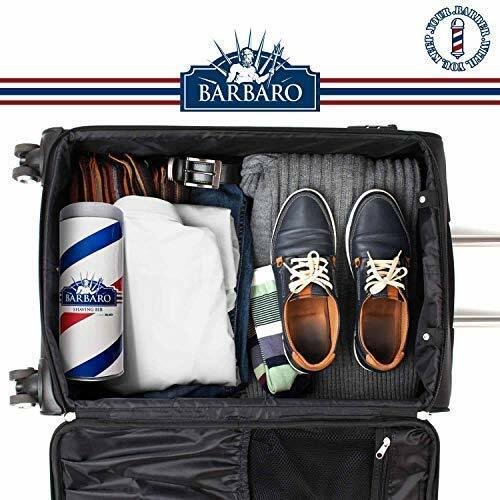 Keep grooming on the go. Rule the Beard, Reign the Look. GREAT GIFT IDEA – Our Shaving Bib makes the perfect gift for for him or her. A gift for all that keeps cleanliness in the bathroom. Best gift idea for Anniversaries, Black Friday, Thanksgiving, Christmas or New Year. HIGH QUALITY – Be careful of cheap bibs. Other bibs are uncomfortable, don’t catch all the trimmings, and hair doesn’t slide off. 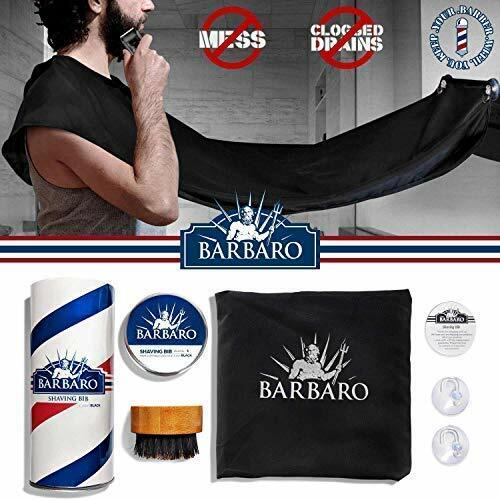 BARBARO’s professional design makes dumping hair easily after trimming with the help of the BONUS maple and boar bristle brush included if needed. We use industrial grade pongee to produce every bib making it ultra durable; however, if you don’t like Barbaro Shaving Bib, send it back within 90 days, and we’ll issue a full refund.